If you're looking for a great (and cheap!) hotel in Branson, CheapTickets is the best place to find them. We offer deals on the best 375 hotels throughout Branson. No matter what you're looking for, we have options for you. Grab great rates on the 171 affordable 3-star hotels that are easy on the wallet without sacrificing comfort. Looking for more luxury? Try one of the 20, 4-star hotel accommodations in Branson. No matter your budget needs, we've pulled out all the stops to make sure you have plenty of vacation options. Maybe you prefer to search for your hotel deals based on what each hotel offers? For example, let's say you just want to find a hotel or resort that has a pool to cool off in after a long day exploring Branson. Scroll down to choose from the 137 hotels in Branson that has a pool for guests. Or search for deals on Branson hotels offering free wifi or breakfast, non-smoking rooms, and more! CheapTickets is here to be your personal travel agent for your next trip to Branson. Get booking today! What hotels in Branson offer free wifi access? Are there deals on Branson hotels offering free breakfast? Yes! The only thing better than finding a great deal on a cheap hotel in Branson is finding one that offers free breakfast. Grab some eggs, a waffle, or some healthy oatmeal before a day full of exploring Branson and all that it has to offer. Below are just some of the many hotels that offer free breakfast in Branson. 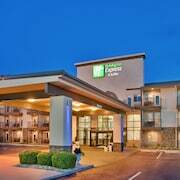 Angel Inn near IMAX is a 2.00 star rated hotel property in Branson that offers free breakfast. 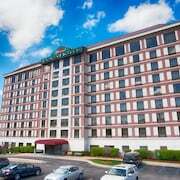 Branson Vacation Inn & Suites is a 2.00 star rated hotel property in Branson that offers free breakfast. 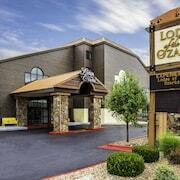 Lodge At the Falls is a 2.00 star rated hotel property in Branson that offers free breakfast. Carriage House Inn is a 2.50 star rated hotel property in Branson that offers free breakfast. What about deals on pet-friendly hotels in Branson? Branson is a great place to get outside and explore with your pets in tow so don't leave your furry friends behind. Below you'll find great deals on hotels in Branson that allow pets. Don't forget to bring plenty of treats! 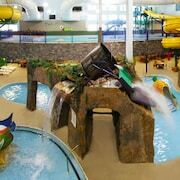 Hilton Branson Convention Center is a popular, pet-friendly, 3.50 star hotel in Branson. Tradition Inn Branson is a popular, pet-friendly, 3.00 star hotel in Branson. Whispering Hills Inn is a popular, pet-friendly, 2.50 star hotel in Branson. 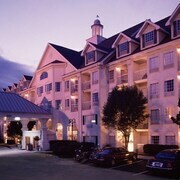 Surrey's Carriage Place is a popular, pet-friendly, 3.00 star hotel in Branson. Any good rates on Branson hotels with restaurants? Absolutely. Don't want to deal with planning our all your meals on your trip to Branson? We don't blame you. Keep the hangry away by staying in one of the 31 hotels that have restaurants. With a room at one of these spots, all it takes to get a good meal is hopping in the elevator. Check out some of the most popular hotels in Branson that have restaurants below. Book Castle Rock Resort & WaterparkCastle Rock Resort & Waterpark is a 3.00 star hotel and has one or more restaurant options. 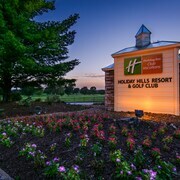 Book Westgate Branson Woods Resort and CabinsWestgate Branson Woods Resort and Cabins is a 3.50 star hotel and has one or more restaurant options. Book Lodges at Timber Ridge By Welk ResortsLodges at Timber Ridge By Welk Resorts is a 4.00 star hotel and has one or more restaurant options. 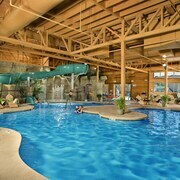 Book Grand Country Waterpark ResortGrand Country Waterpark Resort is a 3.00 star hotel and has one or more restaurant options. What are the cheapest hotels in Branson with pools? What's better after a long day exploring Branson then a relaxing dip in a pool? Finding the Branson hotel you need for a bargain! Cool off and unwind at one of our 137 Branson hotels with a pool. Browse some of the top deals on these hotels and resorts with pools in Branson below, but be warned: You may not want to check out! 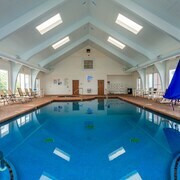 Fall Creek Inn & Suites has a pool and a 2.00 star rating. Chateau On The Lake Resort Spa and Convention Center has a pool and a 4.00 star rating. Southern Oaks Inn has a pool and a 2.00 star rating. Still Waters Resort has a pool and a 3.00 star rating. What hotels in Branson offer parking for guests? Once you've made your way to Branson, the last thing you want to deal with is finding parking close to your hotel. Avoid the hassle of parking around the block and carrying your luggage all the way to the lobby by booking one of our hotels with parking. Check out deals on some of the 130 hotels in Branson that offer parking for guests. Radisson Hotel Branson This hotel has a 3.50-star rating. Best Western Center Pointe Inn This hotel has a 2.50-star rating. Table Rock Resorts at Indian Point This hotel has a 3.00-star rating. Liberty Lodge This hotel has a 2.00-star rating. Do Branson hotels offer 24-hour concierge services? When you're on vacation, things don't always go according to plan. Travel with peace of mind when you book one of our 39 hotels in Branson with 24-hour concierge service. That way you know help is always phone call or elevator ride away. Try Still Waters Resort. It's a 3.00 star rated hotel in Branson that offers concierge services 24 hours a day. Try Angel Inn by the Strip. It's a 2.00 star rated hotel in Branson that offers concierge services 24 hours a day. Try The Suites at Fall Creek by Diamond Resorts. It's a 3.00 star rated hotel in Branson that offers concierge services 24 hours a day. Try Lodges at Timber Ridge By Welk Resorts. It's a 4.00 star rated hotel in Branson that offers concierge services 24 hours a day. What about low rates on non-smoking hotels in Branson? Quality Inn This hotel has a 2.50-star rating. Branson Towers Hotel This hotel has a 2.50-star rating. The Suites at Fall Creek by Diamond Resorts This hotel has a 3.00-star rating. Branson's Best Motel This hotel has a 2.50-star rating. What are the cheapest Branson 3-star hotel deals? Our 3-star hotels bring you quality accommodations at a lower price point for the perfect, budget-friendly vacation in Branson. With 171 3-star hotels throughout Branson to choose from, you still have options. Browse our selection below. Grand Plaza Hotel Branson. Located in Branson Theater District, this hotel is within a 15-minute walk of King's Castle Theater and Hollywood Wax Museum. Titanic Museum and Dixie Stampede Dinner Attraction are also within 2 mi (3 km). Still Waters Resort. This lakefront Branson resort is just 2 miles from family entertainment at Silver Dollar City, and 5.5 miles from Marvel Cave and the Dixie Stampede Dinner and Show. Grand Country Waterpark Resort. This family-friendly Branson resort is located on the Strip, within a 10-minute walk of 76 Music Hall and Dixie Stampede Dinner Attraction. Veterans Memorial Museum and Hollywood Wax Museum are also within 1 mi (2 km). Welk Resorts Branson Hotel. 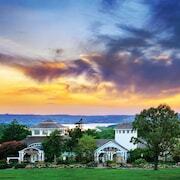 Welk Resort Branson nestles among the trees in the scenic Ozark Mountains, close to Table Rock State Park. The Silver Dollar City theme park and the attractions of Branson can all be reached in under 20 minutes, and it’s less than 20 miles (33 km) to Branson airport. What are the best deals on 4-Star Hotels in Branson? Branson is full of hotels and it can be hard to narrow down where you really want to stay. Luckily, we've done that hard work for you be narrowing you from 375 hotels throughout Branson, to the 20 4-star hotels in Branson. Our 4-star hotels in Branson are exactly what you need for your next family trip, romantic weekend, or solo getaway. Check out our most popular deals below. Cliffs Resort Table Rock Lake: Located in Indian Point, this condominium resort is 1.6 mi (2.7 km) from Silver Dollar City and within 6 mi (10 km) of Shepherd of the Hills Outdoor Theater and IMAX Entertainment Complex. World's Largest Toy Museum and Indian Point Park are also within 6 mi (10 km). Lodges at Timber Ridge By Welk Resorts: This family-friendly Branson condominium resort is located in the entertainment district, within 2 mi (3 km) of Lawrence Welk Champagne Theater, Shepherd of the Hills Fish Hatchery, and Branson Craft Mall. Titanic Museum and Hollywood Wax Museum are also within 3 mi (5 km). 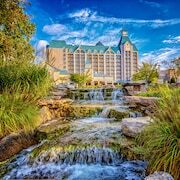 Chateau On The Lake Resort Spa and Convention Center: Known as the &#34;Castle in the Ozarks,&#34; this resort is set on a wooded hillside overlooking Table Rock Lake, 8 miles from downtown Branson and within 4 miles of the theater strip and Celebration City. What are the best activities to do in Branson? Legends In Concert: Starting at just $40 per person. New Jersey Nights: Starting at just $45 per person. Dublin's Irish Tenors & The Celtic Ladies: Starting at just $45 per person. Branson Hollywood Wax Museum Entertainment Center: Starting at just $26 per person. Just wish they had a complimentary breakfast!! The room was nice and clean!! One of the machines for snacks wouldn’t give us what we wanted! Waiting to see if there was a charge for that!! Kids loved the 3 foot deep pool (no deep end) but no hot tub. Ran out of clean pool towels Went on a busy spring break weekend. Good breakfast. Even green Krispy cremes for St Patricks Day. Very beautiful. Good breakfast! Friendly and helpful staff! Had a great time there. Great place to stay! I’ve stayed at this condominium complex multiple times over the last 15 years. Not much has changed including the decor and appearance of the properties. I continue to stay here because it fits my families needs and it’s confortable. However, the owners need to invest in updating the condos themselves. Convenient location, good value. Great complimentary breakfast! Nice and quite place to stay. Traveled with pets so that was also a plus. I just wish the side doors had key access back in to the hotel so I wouldn't have had to take my furry kids through the inside hallways.